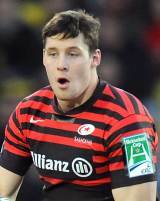 Joel Tomkins joined Saracens in November 2011 after a cross-code switch from the Wigan Warriors. He made his Wigan debut in 2005 at the age of 18 and never looked back in the 13 man game, going on to make 125 appearances until his switch to Saracens. A second row forward for Wigan, Tomkins, he demonstrated his skills by scoring a length of the field try in the 2011 Challenge Cup final to help Wigan to a 28-18 win. He also won the 2010 Super League Grand Final with the Warriors. An England international, he made his debut for his country against France in 2010 and won four caps. At Saracens, he started on the flank but established himself at outside centre. He formed a key partnership in the middle of their backs with Brad Barritt and played the majority of their matches in the 2012-13 season. This led to England recognition when he was named on their summer tour to Argentina.